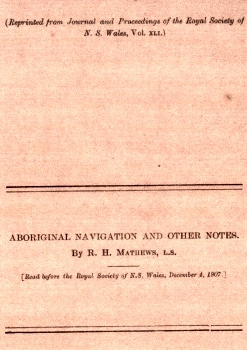 R. H. Matthews : Aboriginal Navigation, 1907. Aboriginal Navigation and Other Notes. Read before the Royal Society of N.S. Wales, December 4, 1907. Mathews, R. H. (Robert Hamilton), 1841-1918. .
By R. H. Mathews, L.S. In this paper I have briefly touched upon the aboriginal methods of navigation, for the purpose of showing that practically the same kind of canoes and rafts is used throughout Australia, which is suggestive of the unity and common origin of the native race. Canoes made from a single sheet of bark, generally stripped from a bent tree, were used by the natives of every part of Australia, with the exception of a portion of the coast of Western Australia from Eucla to Albany and onward about as far as Gladstone. One of ray friends who has been acquainted with the country between Perth and Israelite Bay since 1844, states that he never knew or heard of either canoes or rafts being used by the natives between the points mentioned. Canoes were never seen among the natives of Tasmania, but rafts took their place. The rafts were made of two or more logs of buoyant wood lashed together with bark ropes or thongs of skin. Rafts were also in use on the north-west coast of Western Australia, all the way from the mouth of the Gascoyne River along the seaboard to Cambridge Gulf, and on as far as Port Darwin. Footnote 1. 'Narrative of a Survey of the Intertropical Western Coast of Australia' (London 1827) Vol. I, p. 90.
on the Murray River in New South Wales or on the Gippsland lakes in Victoria. From Port Essington, which is one of the most northern points of the Australian continent, to the southern coast of Tasmania, comprises about thirty-three degrees of latitude. These facts show the wide geographic distribution and uniformity of our native navi­gation, whether by canoes or rafts. With the exception of Tasmania and the portion of the coast of Western Australia above referred to, canoes were used in the same regions as the rafts. When a suitable sheet of bark was not obtainable for making a canoe, a raft was constructed in its stead. I have seen both canoes and rafts afloat at one time on the same large lagoon in New South Wales. Although the canoe is more serviceable for many purposes than the raft, yet the latter possesses the advantage that it is not so subject to damage by accident, or exposure to the sun. Bumping against a sharp rock or other obstruction may cause an injury to one of the logs or bundles of which it is made, without interfering seriously with the buoyancy of the rest of the raft. Such a mishap to a canoe might damage it beyond repair, or even cause it to sink. Perhaps this is the reason why rafts are so universally used. 1. 'Narrative of the Expedition to Botany Bay,' (London, 1789), p. 84. 2. 'Van Dieman's Land,' (London, 1820) pp. 127-128.
land of Australia by Bass' Strait. I am of opinion, how­ever, that it is quite possible that the Tasmanians crossed over in their rafts from island to island, long after the continuous land connection had been broken through by the sea. For a long period subsequent to the first severance of Tasmania from Victoria, there probably was a chain of islands extending from Wilson's Promontory via Kent's Group, Flinders and other islands to Gape Portland. There were no doubt other islands at moderate intervals, reaching across from Gape Otway via King island to Cape Grim, and at other places as well. All such islands, with the exception of those at present in existence, have disappeared either by subsidence or by the wearing action of the sea. The hypothesis just stated appears to me more reason­able than the old theory that the Tasmanians travelled on dry land all the way from Victoria to their final home, because it brings us down to a much later geological epoch and agrees better with the time usually assigned to the advent of man. Moreover, from my investigations among the natives of South-east Victoria, as well as among those of the Great Australian Bight, I am disposed to think that there is not much difference between them and the defunct inhabitants of Tasmania, pointing to the conclusion that they have not been separated by a very great interval of time. In certain northern portions of Australia, abutting on the shores of the Gulf of Carpentaria, the natives employed two or three or more pieces of bark in building a canoe, and it is noteworthy that such crafts are more elaborate in their manufacture than those in use in the southern parts of the continent, a fact which might suggest foreign influence, such as that of the Malays or Papuans at some comparatively recent period. wise used on some of the rivers flowing into the Gulf of Carpentaria. The "catamaran" and the "dug-out" canoe, now used by the aborigines of Cape York Peninsula, Port Darwin, and other northern parts of the continent, will not lie included in this article, because I do not consider them of purely Australian origin, but believe them to be intro­ductions from Torres Straits. I would like to offer a few remarks on certain statements made by two of the early writers on the New South Wales aborigines. Some years ago I was all through that district discharging my duties as a sur­veyor, and being aware of Dr. Bennett's statement, I made inquiry from old blackfellows if ever they had made canoes out of wood, but they had never heard of such a thing. I also asked white settlers of long standing in that part, and their replies were to the same effect. I am of opinion that Dr. Bennett was told by white people that the natives sometimes used dry logs of kurrajong and other light and buoyant woods as rafts, and that he did not differentiate between these and the actual canoe. Mr. G. P. Angas says:—"Their canoes were very rude. To the southward and on the Murray River they are mere pieces of bark tied together at the ends and kept open by means of small bows of wood. Footnote 1. 'Wanderings in New South Wales' (London 1834) I, 115. In 1850 I was working amongst stock on the Clarence and Nymboida, two impor­tant rivers in northern New South Wales, when the blacks were numerous and I saw them almost every day. I frequently crossed streams in bark canoes, but never beard of one cut out of a log of wood by the blacks. In several parts of New South Wales, however, I have seen canoes made by white men for crossing over rivers at sheep and cattle stations. A large, hollow tree was selected aud cut down. The rotten interior was burnt out, and then cleaned more thoroughly with an axe. The ends were then blocked up with thin wooden slabs, securely nuiled in position and afterwards caulked with rags or wool. From the vagueness of the statements of both Dr. Bennett and Mr. Angas, I feel confident that they never saw log canoes (or "dug-outs") in use by the natives, but that they were misled by the careless reports of white men. It is of course possible that some of the aborigines occas­ionally copied the white man's method of constructing a canoe, after they had been supplied with iron tomahawks and axes, but I never heard of such a case. Footnote 1. 'Waugh's Australian Almanac for 1858' (Sydney) p. 66. Geoff Cater (2014) : R. H. Matthews : Aboriginal Navigation, 1907.